‘Trump is a good man and I pray for him every day,” Galagoda Atte Gnanasara told me in late April, later bragging that he himself is even better than U.S. President Donald Trump. Gnanasara is Sri Lanka’s notorious rabble-rousing monk and leader of the Bodu Bala Sena (BBS), or Buddhist Power Force, a radical nationalist religious organization. He draws crowds of tens of thousands and is known for inciting violence targeting Muslims. Gnanasara’s praise for Trump came when I asked him about the Muslim travel ban. Gnanasara whips crowds into a frenzy, passionately exhorting Buddhists to rise up and protect what he believes is being threatened — namely their Sinhalese identity. He insists he is not anti-Islam, only anti-extremism. In person, he is mild-mannered and thoughtful, a man living with minimal security despite making many enemies. In his monastery in central Colombo, there is a bank of security monitors, but aside from a few acolytes the compound is only watched over by a large statue of Kannon, the goddess of mercy. The BBS was established in 2012 following Sri Lanka’s long civil war from 1983-2009, which pitted the nation’s Buddhist ethnic Sinhalese majority against the ethnic Tamils in the northeast of the island who were fighting for an independent homeland. The nation remains deeply scarred by this conflict. Farzana Haniffa, a sociologist at the University of Colombo, told me BBS was launched to mobilize militant monks and the public against Muslims because the state was looking for a new enemy to help unify the Sinhalese community. It is widely believed that the BBS was the brainchild of Gotabhaya Rajapaksa, defense minister at the time and brother of then-President Mahinda Rajapaksa . State sponsorship apparently endowed BBS with impunity, power and funding, but when the Rajapaksa government was ousted in the 2015 elections, the BBS lost its patron. Since then Rajapaksa has blamed the BBS for the defeat, accusing the group of alienating Muslim voters who backed his rival en masse. Gnanasara acknowledges this may be true, even if it was not his intention. Muslim voters believed the BBS had orchestrated attacks on their community, including the 2014 burning of Muslim shops and homes just south of Colombo following incendiary BBS rallies. Gnanasara denies responsibility for these incidents, accusing the media of sensationalism in blaming his speeches for subsequent mob actions. Gnanasara thinks Rajapaksa actually supports BBS. “My feeling is that he knows that what we discuss is correct, but he cannot openly tell this to the public,” he said. He complains that “a Sinhalese man can only marry one woman; Muslims can marry four or five.” This law, he argues, is why the Muslim population, about 10 percent of the nation’s population of 21 million, is rapidly expanding, posing a demographic challenge to the Sinhalese Buddhist (70 percent of the population) character of the nation, something he seeks to defend by limiting the number of children per family. He is satisfied that his message about “cultural destruction and the threat of Islamization” has gone mainstream, claiming this as a major success. Haniffa, a Muslim woman, laments that Gnanasara is essentially right, because in her view anti-Muslim sentiments are widespread and have become far too accepted in society. Sri Lanka, he warns, is overly tolerant, and claims that tolerance is something that doesn’t exist in any Muslim-majority nation. He warns that if nothing is done to stop the creeping Islamization of Sri Lanka, intolerance will prevail. 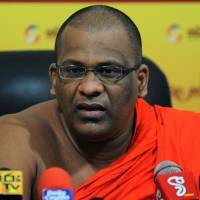 Gnanasara is unrepentant about agitating in areas where holy sites are disputed with Muslims. 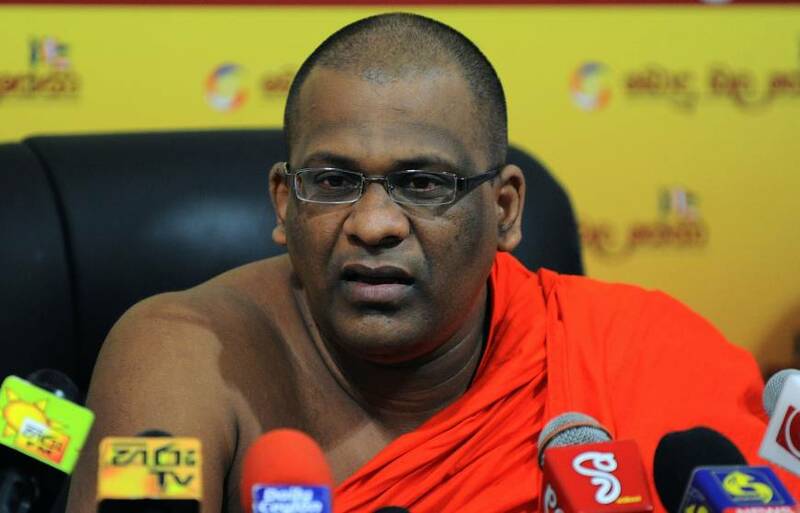 In May, shortly after we met, the media reported that hundreds of monks surrounded Gnanasara to prevent police from arresting him in connection with local riots linked with an attack on a mosque. He has now gone into hiding. Several similar attacks on mosques and Muslim shops, attributed to BBS, occurred around that time. Alas, the politics of hate remain unquenched.